The Advent book this year is a bit different from those in the past. 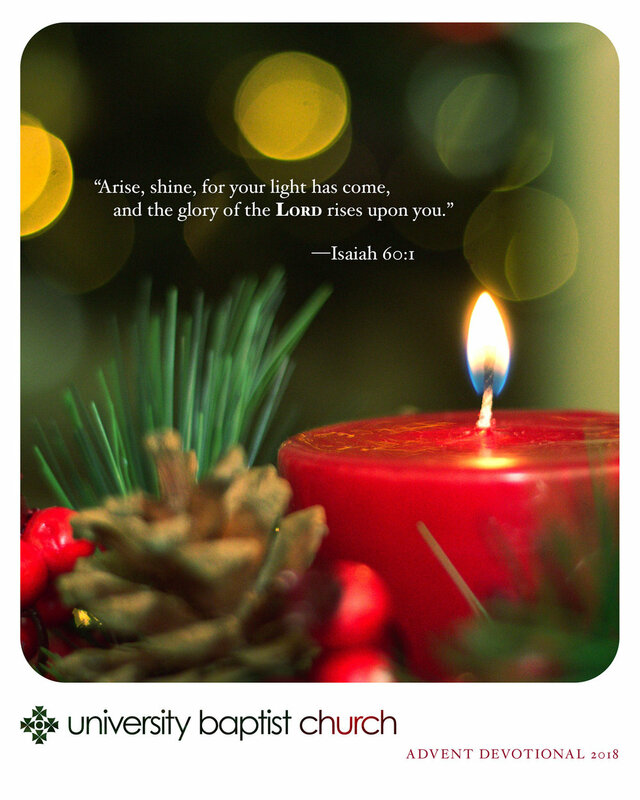 We are focusing on the Advent candle. Many people have wondered just what is behind its meaning. The first week celebrates hope, the second peace, the third joy, and the fourth love. Thanks to Corey Fuller who is so faithful to provide our Advent cover. Justin Dunn, our pastor, not only helped with scripture selection, but he also wrote and helped with getting writers. Brent Newsom helped recruit writers. Mike Atchley puts the articles on the web site, and Marguerite Guinn binds the books. We could not do this project without willing writers, and we know what a busy time of year this is for all of us. Thank you to each one who volunteered for these jobs. As always, some editing must take place. If there are errors, I take the blame for those. The scripture readings are listed at the beginning of the book along with the names of the writers. It is expected that each family will read those each day since there is not enough room to print them and still leave room for the thoughts of each writer. Prayerfully consider what each writer is attempting to convey about this season and the emphasis for each week. Blessings! Advent. The word itself comes from Latin and means “arrival” or simply “come.” In Christian theology it signifies the season leading up to the celebration of the arrival of Jesus: God incarnate. In the following pages the community of UBC reflects upon the impact and anticipation of Christ’s first earthly arrival and the implications of His Kingdom’s arrival. He has come and with Him the ability for all to have and to demonstrate: Hope, Peace, Joy, and Love. He is coming again and the complete picture of Hope, Peace, Joy, and Love will be realized. This collection of devotions is a reflection on the Scripture in light of God’s Word made flesh. It is our desire that they will build within you, within your family or group, a renewed recognition of the coming of Christ and what that can mean for the living of life. Christ has arrived, arisen, and assembled His people to spread Hope, Peace, Joy, and Love to a world in great need.